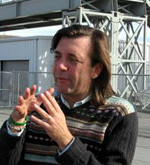 Horace “Ori” Della Penna is Thunderbolt Aerosystems original “angel” investor whom provided the initial seed funding to allow the ThunderPack get off the ground. Mr. Della Penna and Mr. Amarena met each other in the early 1980s while sharing their mutual passion for motor racing and their personalities where honed by their early years of education while in their native Argentina. Mr. Della Penna not only had blind faith in Amarena’s vision and technical prowess, but he quickly recognized the financial opportunity of the ThunderPack as well as its limitless potential for civilian service and personal entertainment market. Ori received his degree of Aircraft Mechanic at the Teterboro School of Aeronautics, Teterboro, NJ and like Amarena has been involved in motor racing both behind the wheel as well as on the board room, and along with brother John Della Penna have dealt with every aspect of motor sports around the world – including helping to develop the careers of many professional drivers. Della Penna is now in charge of procuring the interest of second round investment for the development of Phase 3 of Thunderbolt Aerosystems’ long-term vision, which includes the THUNDERJET and Camp-Zero training center.